It's another happy Saturday with a new challenge from the Compendium of Curiosities! Now that I've got my project done, my day will be filled with making Christmas cookies with my daughter and one of her best friends. We get pretty artistic with our cookie decorating, so if you like that kind of thing, check me out on Instagram or Facebook this weekend. It's another challenge in the Compendium of Curiosities Vol. 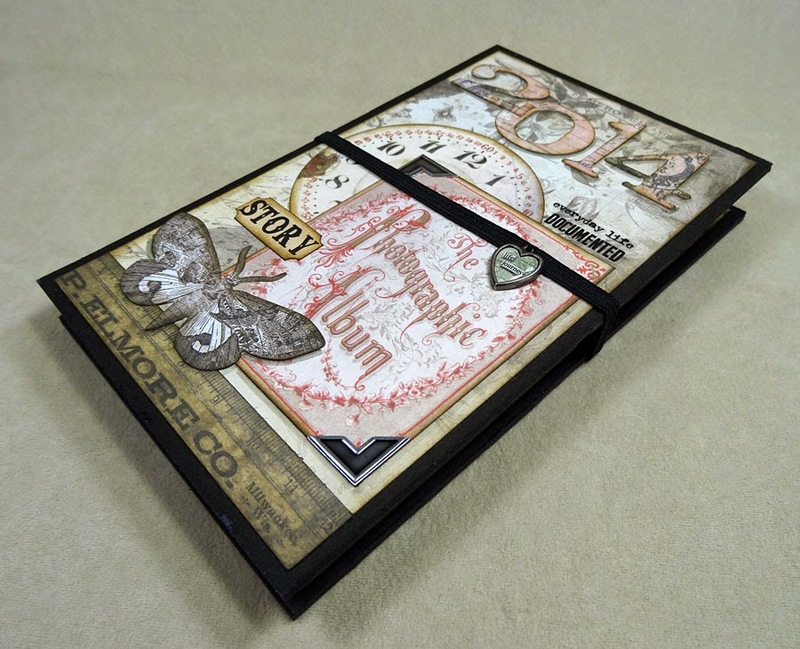 III series, hosted by the lovely Linda Ledbetter, featuring techniques and products from the master of distress Tim Holtz. We're working our way through his fabulous book and the new challenge is Pocket Pages and can be found on page 36. 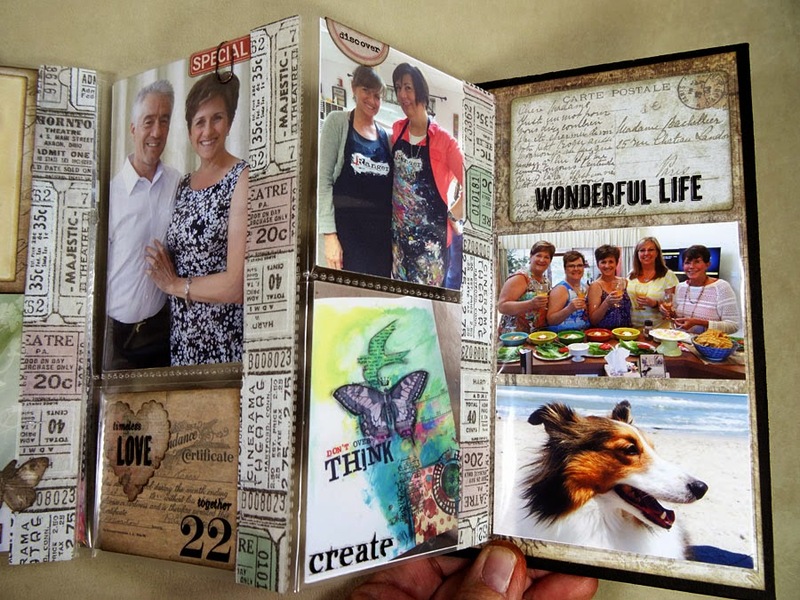 We invite you to join us by creating your own project using the technique or product featured, upload it to Linda's site here, and thus be entered to win one of two fabulous prizes! We LOVE being inspired by you! You can read all the details at the end of my post, and remember, there ARE rules so read those carefully. As with all the challenges, before I begin I ask myself "What do I need? What function will my project serve?" 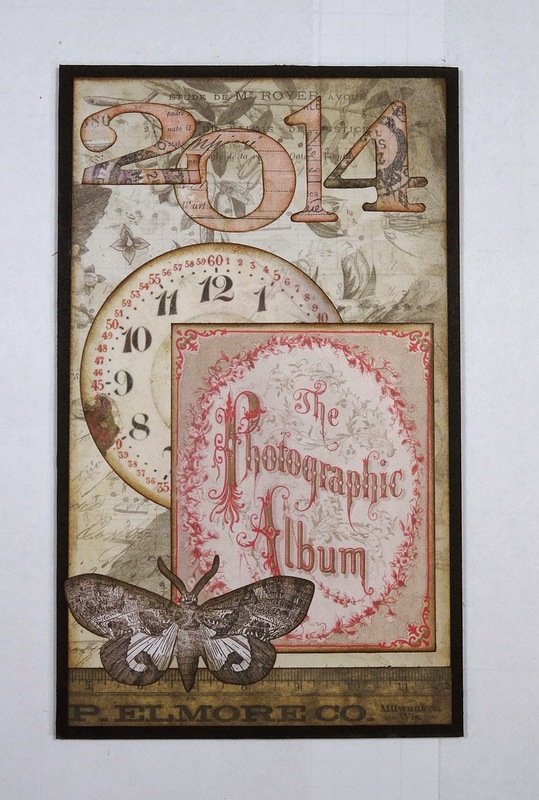 Since it's almost the end of 2014, I decided on a year-in-review mini album made with a variety of pocket pages. 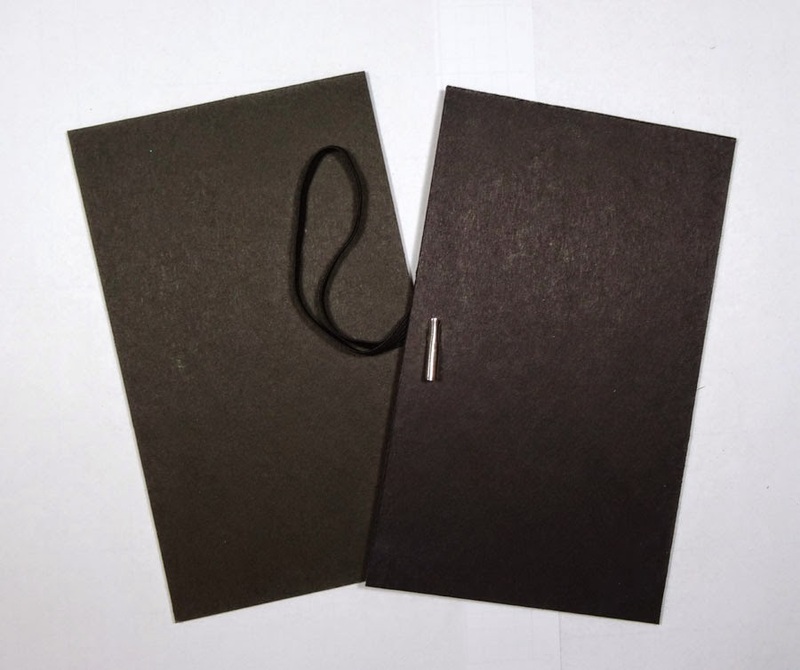 I started by creating a front and back cover for my pages by cutting two pieces of thick black chipboard 4 1/2" x 7 1/2", punched a hole with my Crop-a-dile and inserted an elastic loop to the back cover. 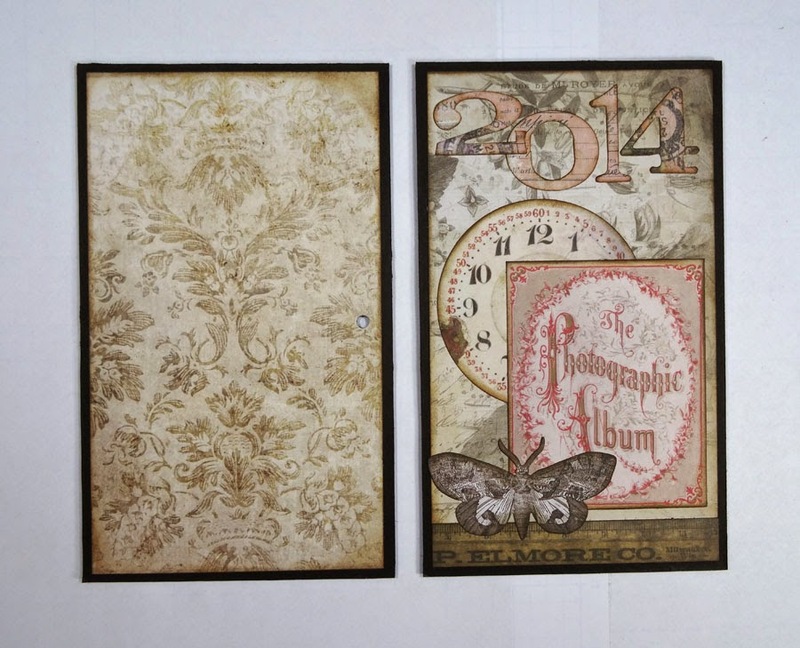 I started to decorate my cover with Wallflower papers and Thrift Shop ephemera. I die cut 2014 from the Word Play die. I added more Wallflower paper to the back cover and to the insides of the front and back covers. ...then connected the first to the cover and the last to the back cover. Now it was time to print some photos. I scrolled through my iPhoto albums, which I always label as I import new photos, and therefore can find specific photos quickly. I decided to choose the top 20 events throughout the year. For certain events, I selected just one photo and for others--such as our trip to London--I selected a few. I came up with a total of 25 photos. 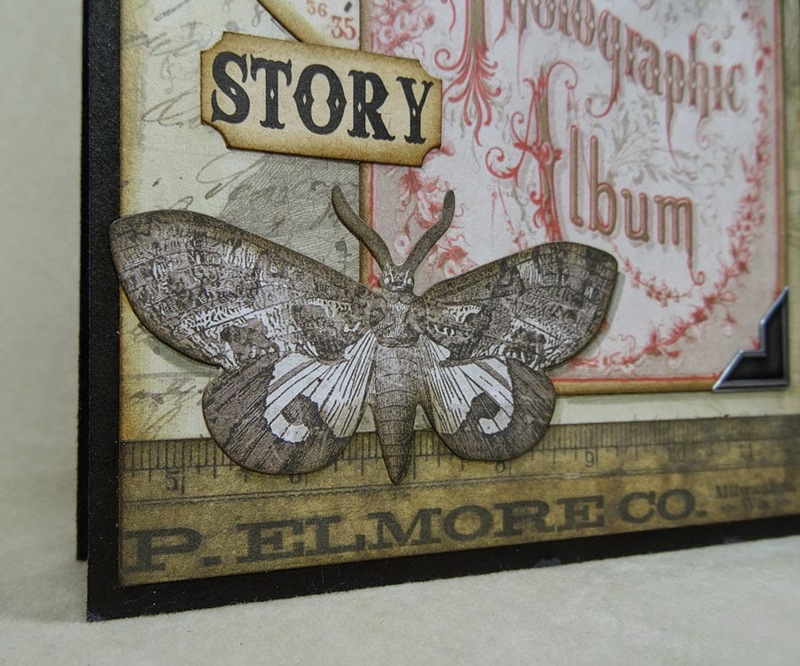 I set up a letter-size page in PhotoShop Elements and after cropping each photo to fit the space in my pocket pages, I pull each image onto the letter size page. I try to get as many as I can on the page, sometimes rotating photos to get them to fit. Then I simply print and use my paper trimmer to cut them all out. To adorn my pages, I stuck with the ephemera packs (Thrift Shop and Expedition), several remnant rubs, chit-chat stickers, label letters, and industrious stickers. Sorry for the glare. It was tricky taking these photos at night in my studio. As you can see, some of the photos I selected are just everyday types of things, like Jamie with her new ombre. And other major events such as Paul at Arlington National Cemetery at his father's burial ceremony. And then there's Jamie and her best friends all stuffed in my bedroom closet during a tornado warning. Other photos: Hubby Paul and I celebrating our 22nd anniversary, my first official art journaling class with Dina Wakley, my girlfriends making cards together, and of course our sweet Suki walking on the beach. Flip the album around and more photos. Our trip to London, more Suki, and Jamie at MetroCon. The final three pocket pages have photos of Jamie in color guard, Paul and I cracking up, more girlfriend time, and our little family photo at Thanksgiving. As you can see, the last space is empty, waiting for one more photo on Christmas Day. 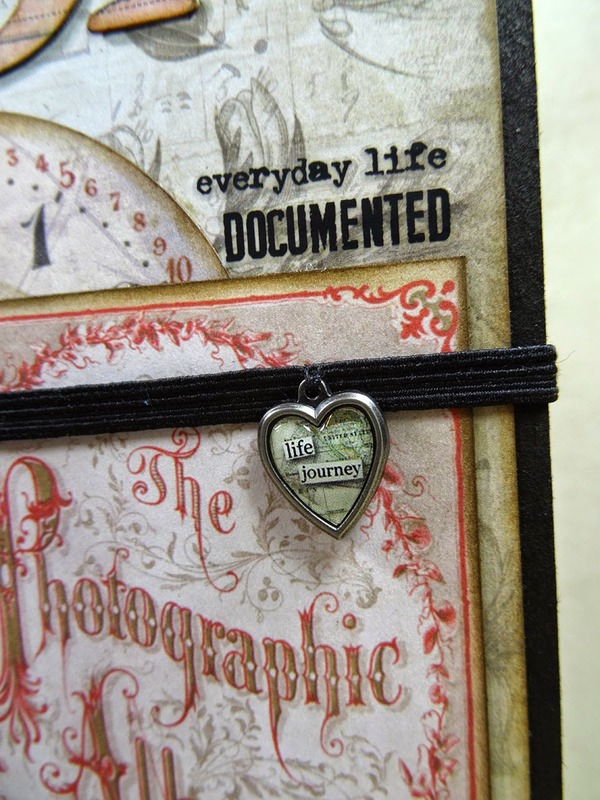 After completing the inside pages, I came back to the front cover and embellished it further with a heart charm sewn to the elastic band, industrious corner stickers, remnant rubs, and an adage ticket cut down smaller to focus on the word Story. The band comes all the way around the book to secure it. When lifted away, the album can open all the way out. I love that I have this quick Year-in-Review mini book to scan through to remind myself of the fantastic year we had. I might just do this every year! 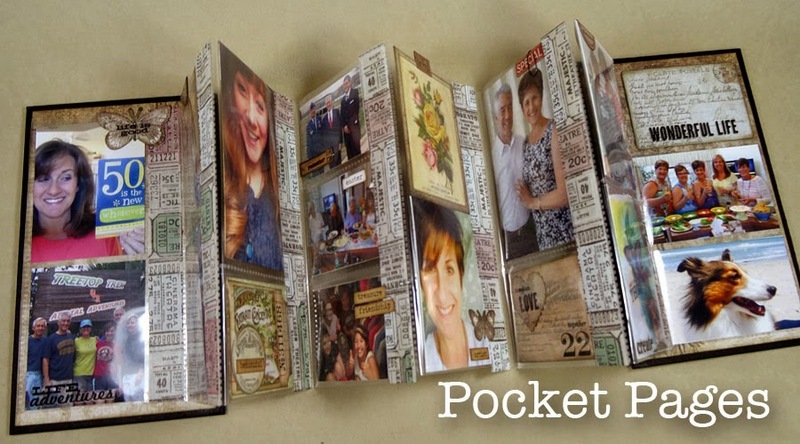 Now it's YOUR turn to give Pocket Page a try! And don't forget, you can find many of these great products I've used today at The Funkie Junkie online store. Love your little mini look back at 2014, Annette! 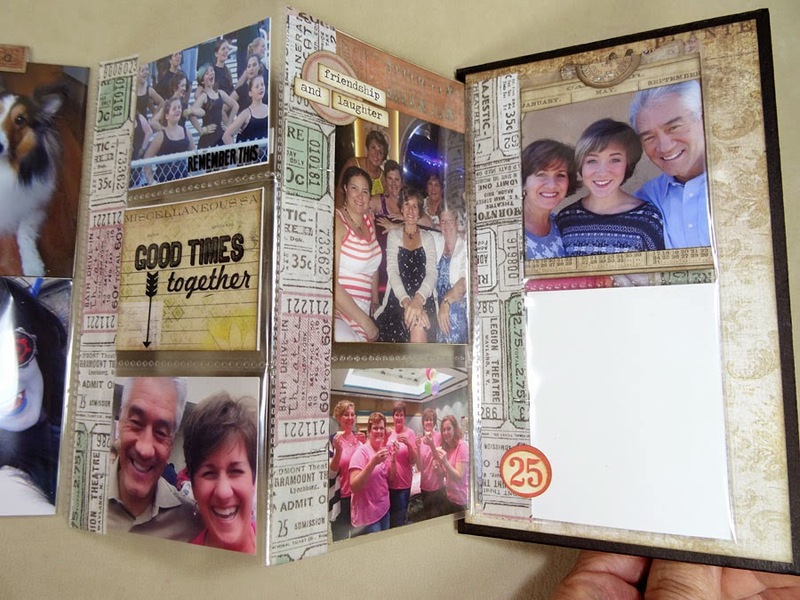 This is such a wonderful and clever way to use the pocket pages, I love your little album and how lovely to have such special memories all tucked inside there. I hope you and your family have a wonderful holiday season. Fabulous pages Annette! I love this idea of a year in review. :) Merry Christmas to you and your family! 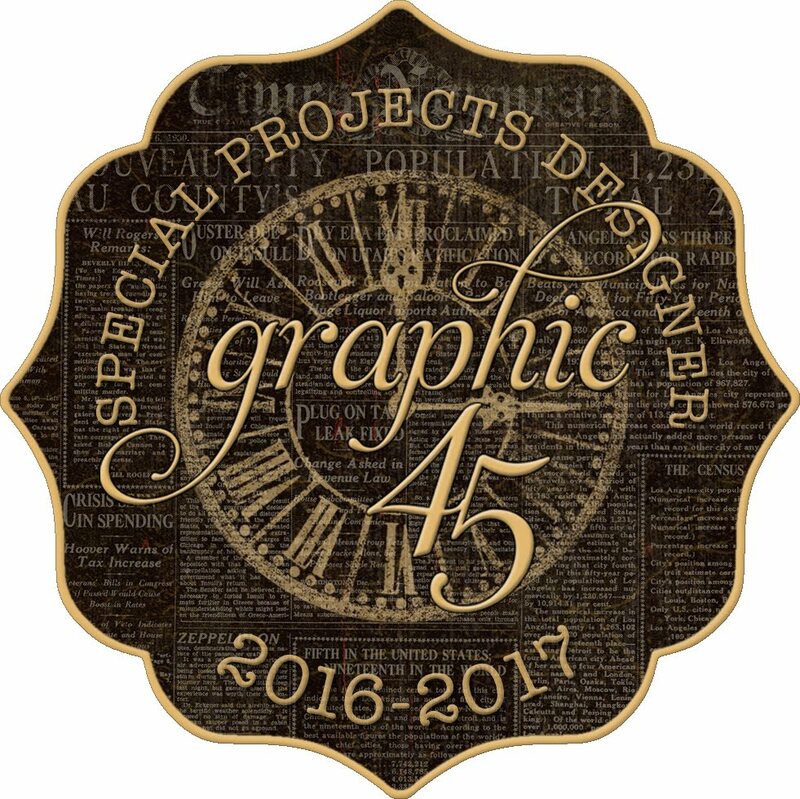 What a special album and your pages and beautiful pages are a treasure! 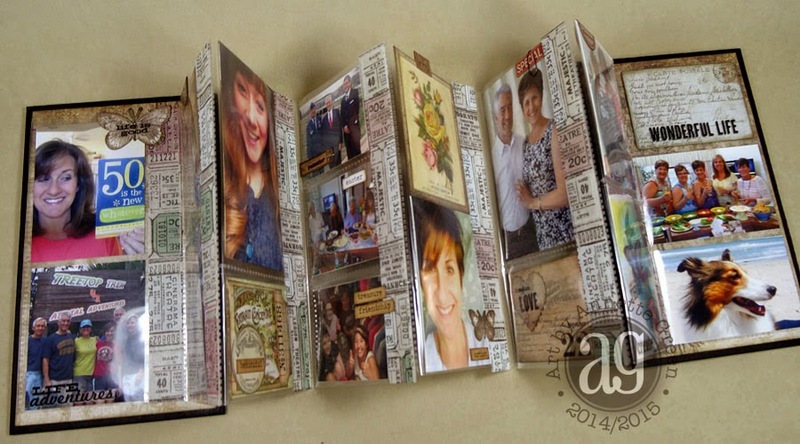 This is such a fabulous mini-book, Annette! I absolutely LOVE it! 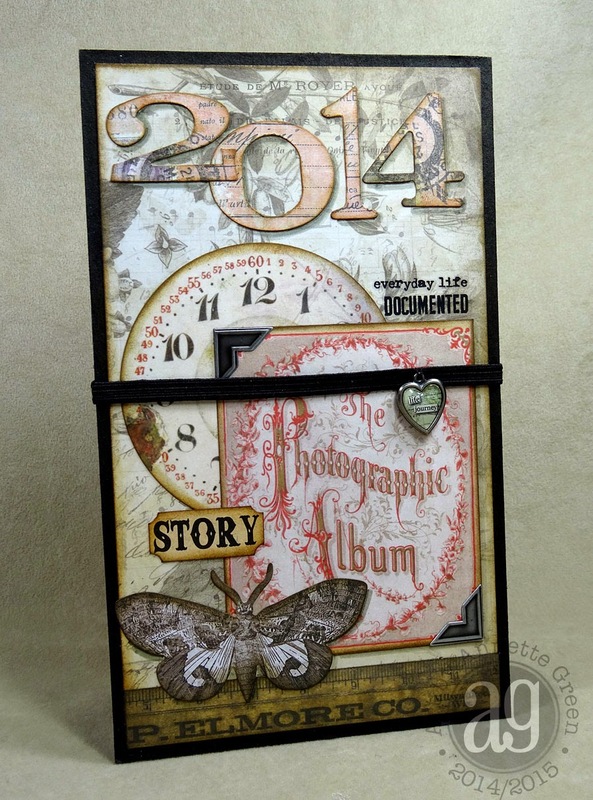 What a great idea to do a "year in review" book. I love all the photos as well as the idea of connecting all the pages! I really love this adorable pocket page mini! Your photos are lovely and its definitely a great way to document a year in review of the highlights in your family's lives. I wish you a Merry Christmas and a happy and healthy new year! Your 2014 pocket mini is so beautiful. I love everything about it. I wish I had a family so I could make something like this too treasure. You are full of talent and I look forward to seeing your Blog messages that come to my email. Your posts really brighten my day. God bless you hunny and thanks for the sweet inspiration that you share with all of us. Hope you & your family have a very Merry Christmas and a Happy New Year. Do you think y'all will be doing another one of these projects next year (the Tim challenge)?? I don't have the book, but i have his first and 2nd book. 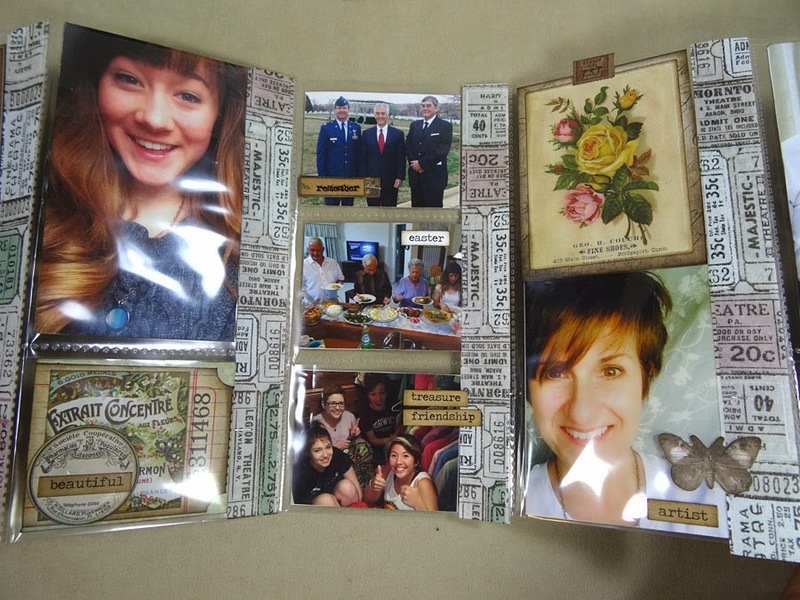 Wonderful project, Annette! I think I need to make one of these. I have all of the materials and have been waiting for t=just the right thing. Love yours! What a neat idea Annette! It would be a great tradition to start...to reflect back on the previous year before moving on to the next. Sometimes I don't think I stop long enough to appreciate all of the gifts I have been given. Thanks for the inspiration! 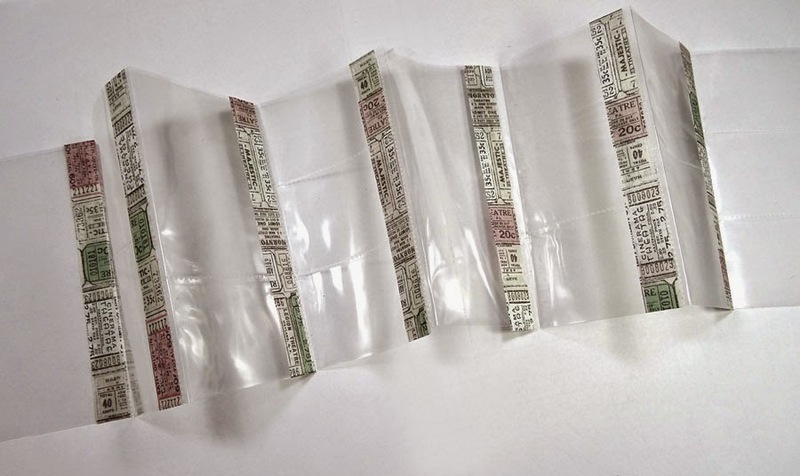 What an awesome idea ; love the papers you used ! As soon as I saw pocket pages I thought about something like that ... we shall see what I end up doing ! 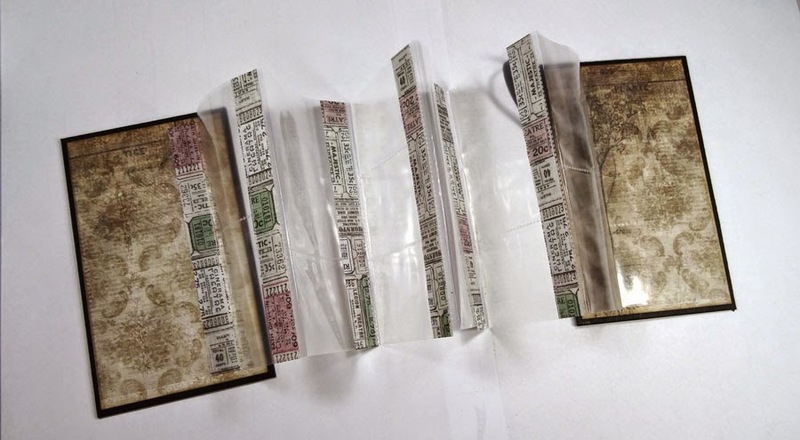 Love your use of the pocket pages for your book. Beautiful work. 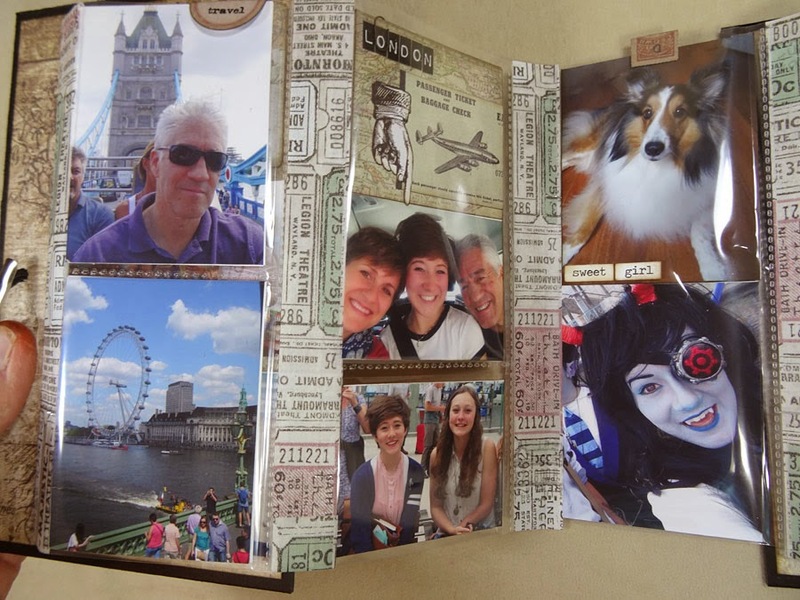 Annette, I have to say your project inspired me the most for making my travel album for my niece which I have linked up at CC3. I love the accordian fold and how you did it, but I had an idea I knew I wanted to incorporate, so I changed it up a bit. 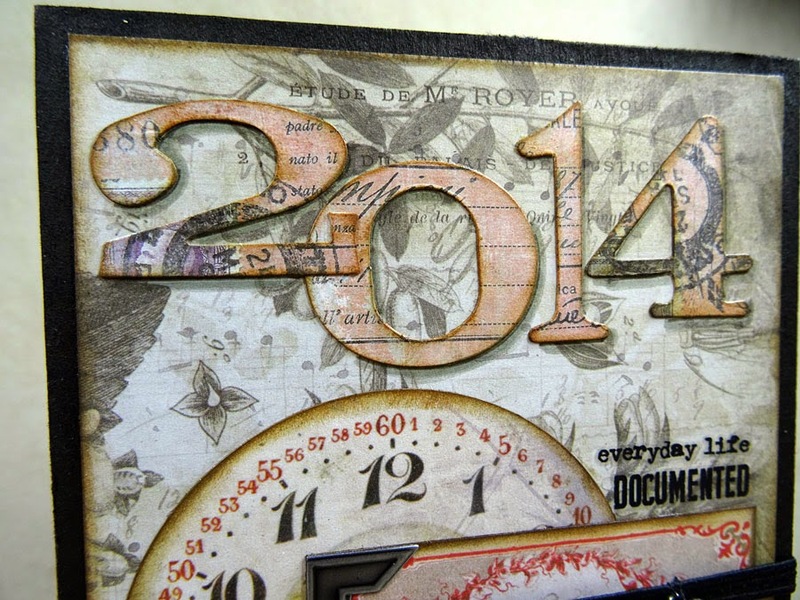 I love all your ephemera and those wonderful photos that tell your year's story! Perfect! And your cover is to die for! I should have just taken your measurements and been done with it...but NO! I had to do it for myself! Ha Ha! 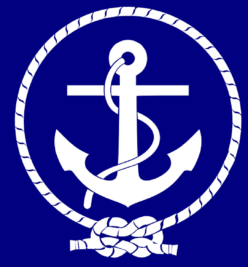 I did borrow an idea from an old post of yours and referenced it in my post. My daughter wants one of these albums and when I make hers I will use the Wallflower stash (which I am hoarding) and your measurements. Thank you so much for sharing your lovely work! Wow what a great idea,all our photos seem to stay on phones or laptops, I may have to give this a try. Love all the great additions to the photos too. This is a fabulous album; you had a great 2014! 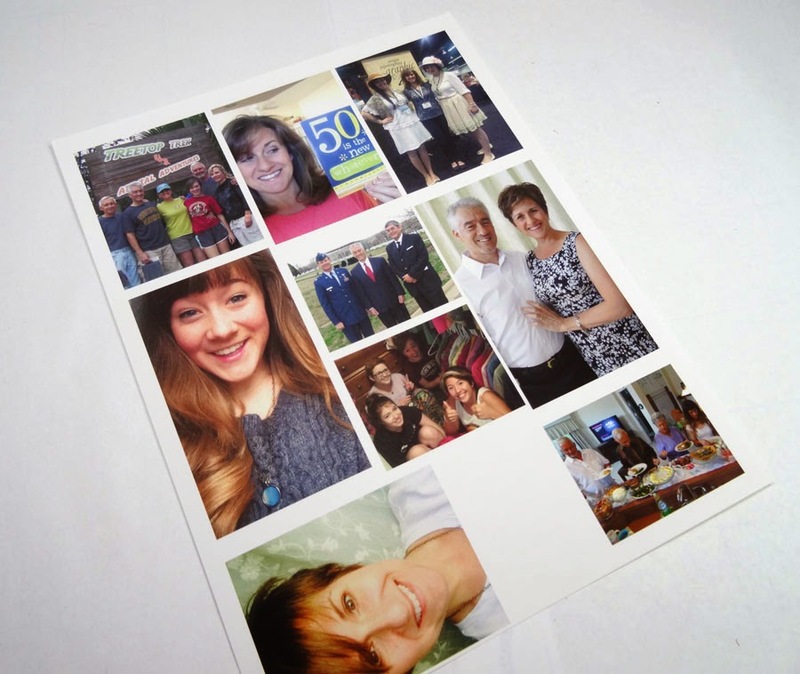 Love the tip on how you print your photos. I hope you have an equally great 2015! Linda you always have such great ideas. I love what you did here with this album of memories. Great idea and beautifully done. What a great idea! 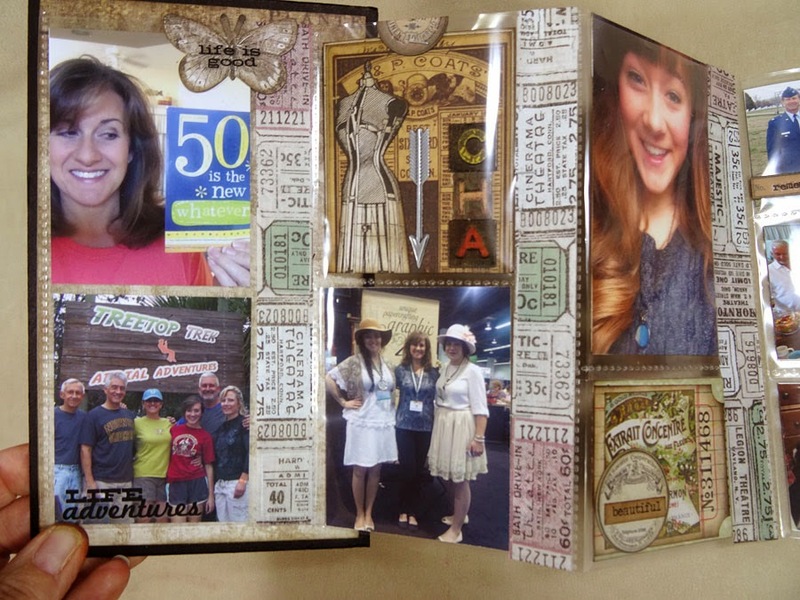 I like to add photos and journaling to purchased mini-calendar each month, but this is so much more personal and I'll bet it was super fun to make! I love how the cover turned out; so pretty and timeless.